A browser is probably the most important software application for me right now. Even more important than an Operating System. Computer without network these days is as useless as car without petroleum or yacht without sails and browser is the primary tool to use the internet. Not that long ago I used to use dedicated programs for many important things and now all those things I do with the browser. Of course I still use other programs, but a browser is the king. 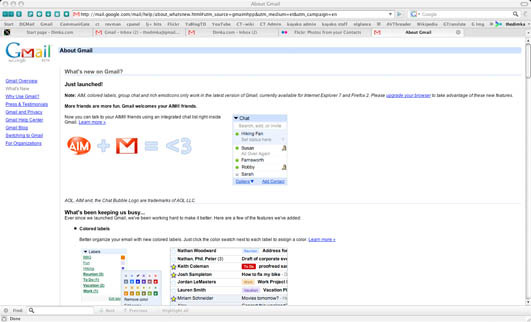 Google (GMail) is the provider for most of my mail and preferred instant messaging - google talk, with numerous features that I like and use all the time, like labels instead of folders, automatic addition to contacts, server side archiving etc etc. But google talk is not the most popular IM among many of my friends, they use ICQ (which I don't like). But lucky I am - google now integrates AIM, and since ICQ belongs to AOL it just works in GTalk. So other browsers are developing too, and faster and they get better and better. There ara three other major players in the browser market: Mozilla (with FireFox), Opera and Apple (with Safari). Each of them has a solid list of unique great features and often it is hard for me to clearly decide which one is better. All three work both on Mac and Windows, all three are much better than IE. But to be fair I should mention that each of them also represent a rendering engine, and those rendering engines used by some other browsers, what make pages to look like in a primary browser, but user experience is a bit different. And after few years with FireFox as my default browser I just made a change to Netscape 9.0.x But I still continue to use many browsers and Opera and Safari, as well as FireFox. This version of Netscape is very similar to FireFox, and pretty much it has all the nice feature and supports all the extensions including the one I use - Google Browser Sync (which is crucial for me, since I rely on it every day) Plus it has few other very useful features, like more control on tabs, text fields and options. It runs on Mac, Linux and Windows and distributed by AOL.